You can’t just count your calories, you need to make your calories count! 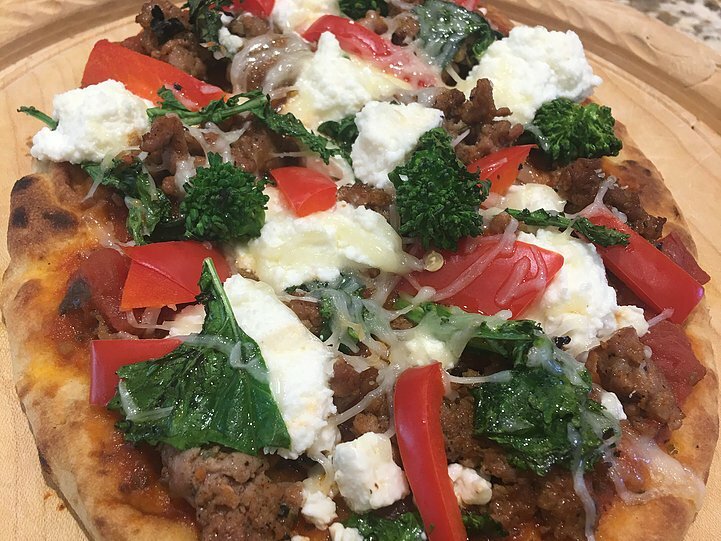 This week’s recipe, the Super Food Pizza, featuring broccoli rabe is loaded with vitamins, and minerals, protein, and fiber. Eating is the most important thing we do every day, unless you count breathing, and that’s involuntary. When you are deciding what to eat, fuel your body with foods that give you the most nutrients. It makes a difference which foods you choose! Watch the video and you can laugh with us as we make mistakes and make some memories! When you burn the naan, don’t panic. Laugh a little, redo, improvise. Honor your mistakes as the path to getting better. Afterall, It’s not really about the food. Here are some benefits associated with super foods: increased energy, improved overall health, better digestion, a stronger immune system, cleanses the body, less inflammation, an alkaline body, prevents heart disease, fights cancer, regulates metabolism, and lowers cholesterol. This is a good substitute for all the frozen pizzas Ari’s been eating. Our pizza is fresh and easy to make, doesn’t take any longer than a frozen pizza from a box, and tastes so good! Make extra toppings and everyone can make their own the next day and the day after. This pizza was so good, we just kept going until we ran out of toppings. Preheat the broiler. Place naan on a pan and broil in the oven for 1-2 min until lightly browned. Chop about 1 cup of broccoli rabe into bite size pieces and toss in a bowl with 1 tsp olive oil and set aside. Cook the sausage in a skillet over medium-high heat. Note: If using turkey sausage, add 2 tsp olive oil to the pan first. Cook the sausage until cooked through, breaking it apart with a spoon or spatula as it cooks. Set naan on a baking sheet. Spread with 2-3 tbs tomato sauce. Top with chunks of sausage, dollops of ricotta, small chunks of feta, red bell pepper, and broccoli rabe. Season with black pepper. Sprinkle with shredded Italian cheese. Broil on middle rack for 5 minutes. Cool a few minutes. Cut into 4 pieces. Enjoy!